Have you heard of Tasty Kitchen? How about Ree Drummond of Pioneer Woman? Well now, I've got your attention. I've followed Ree's humorous blog for some time now. In case you don't know her story, she fell in love with a cattle rancher and married her Marlboro Man. She's got such a flair for writing that captivates me. I love how she shares her everyday adventures as a home schooling mom, photographer, gardener, and ...cookbook writer. 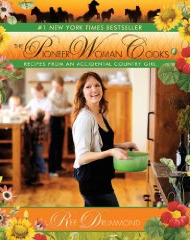 The Pioneer Woman Cooks by Ree Drummond is on the New York Times bestseller list. Way to go Ree! On her book tour, she came to a local Tempe, Arizona bookstore. I really wanted to go so I could meet her in person but it didn't work out. However, the following day I read that the line was so long and the store was so crowded. So I guess I'll have to meet her another time. Well, back to Tasty Kitchen. It is a social network that is for people who love to cook. Ree created a community for people to easily share recipes. I joined it only recently and already have lots of new friends. I plan to add a few of my own recipes soon. There's a guide that easily walks you through the requirements to add your recipes. And you can search for recipes to print or add to your profile. Whenever I find fun things, I love to share them with my blogging buddies. So, check out Tasty Kitchen. BTW, my profile name on the site is Panda444. There's a story behind that name but I'll save it for another time. Thanks for sharing sweetie, love you. Thanks for the recommendation! Sounds great! Oh I admit it! I love everything about her! LOL. Whatever! LOL Just kidding. I'm not jealous one bit. I cannot wait to check our the Pioneer Woman! I am in desperate need of some new recipes! I think this is a great idea, I've already gone over there,and I'm going to join and enjoy the recipe swapping. What fun! Just wanted to hop by and tell you that I continue to pray for you daily, and trust that the Lord is working behind the scenes in ways that will bring you good and Him much glory in the days to come! Another place I visit often is: allrecipes.com. I wish there were no "weighty" consequences to my eating all the delicious things I find. Thank you so much for this! It's just the sort of thing I was looking for! My cooking has gotten soooo boring. this looks great!! going to bookmark it for sure!